The bells at the cathedral in Aix rang out at 3pm, 100 years ago today, after 1561 days of silence, to mark the end of the fighting. And by 6pm, the crowds were at the Rotonde to celebrate. Of the 3000 men mobilised from Aix, 720 were dead, 190 disappeared and 500 left disabled. The story didn’t even end here for those left in the north of France. Despite having been away for four long years, the local regiment was involved in occupation and didn’t arrive back in town until 2nd September 1919. What a homecoming that must have been. But when I was writing my book (Aix-en-Provence: The Inside Story) and researching the chapter on the effect of World War 1 on Aix, it seemed that there was some sort of controversy surrounding the troops from Provence but I couldn’t find details. Then came ‘La Faute au Midi’, a new book and exhibition, which told it all and it was truly an appalling story. When I was writing my book and researching the chapter on the effect of World War 1 on Aix, it seemed that there was some sort of controversy surrounding the troops from Provence but I couldn’t find details. 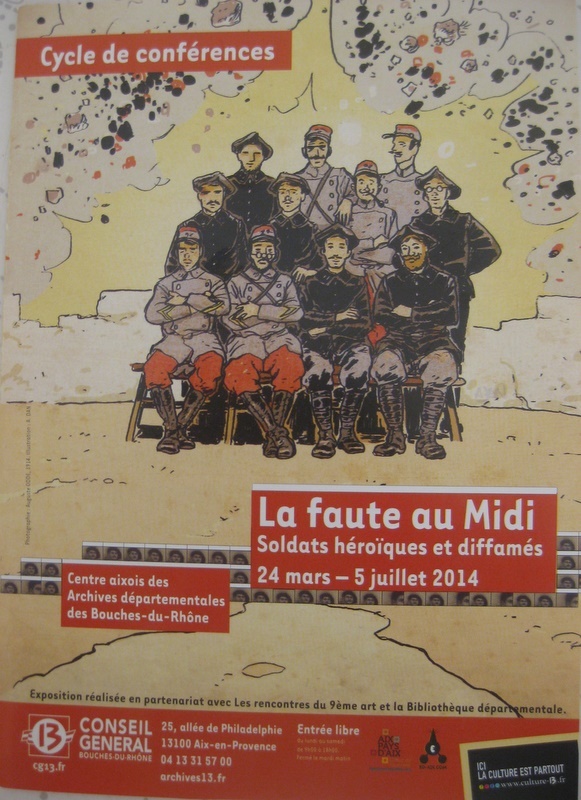 ‘La Faute au Midi’, a new book and exhibition, tells all and it is truly an appalling story. On 1st August 1914, just after 3 in the afternoon, the orders for mobilisation were given – bells rang, gendarmes went to villages on their bikes and posters were plastered on to walls. Young men throughout Provence rushed to get in the harvest before going to enlist and the two companies of professional soldiers based in Aix were soon heading north. The mood was sombre but confident, soldiers expecting to be in Berlin within two months.